We are well known name engaged in manufacturing Token Display Boards in India. These token display boards are micro-controller based and are widely used in the banks and restaurants. It is used for indicating the token number that is punched by the operator.We offer our clients with queue management systems, which are specially designed for smooth operations at any busy place. These systems help provide comfort to both to the visitors as well as employees. These reduce waiting time and improve service quality. We offer best quality of Token System Display Boards to cater the requirements in various sectors. Digital Display - 0.5” Height 7 segment LED (Bar) Digits. 16 Keys Telephone Keypad to enter Token Number. Mains Operated. 230 V.A.C., Single Phase, 50 Hz. 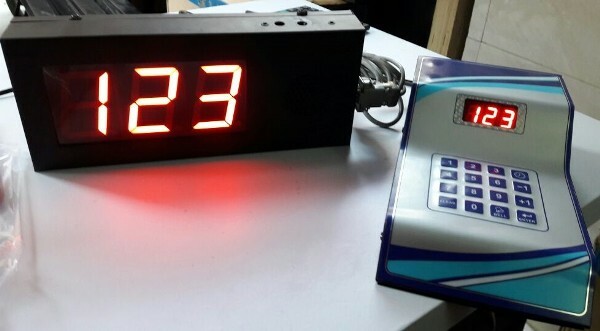 Digital Display - 4” Height 7 segment LED (Matrix) Digits. Suitable for Wall mounting / Hanging.